KTMtwins.com KTM Motorcycle and Product News: Supermoto Wheels for the KTM 690 Enduro! 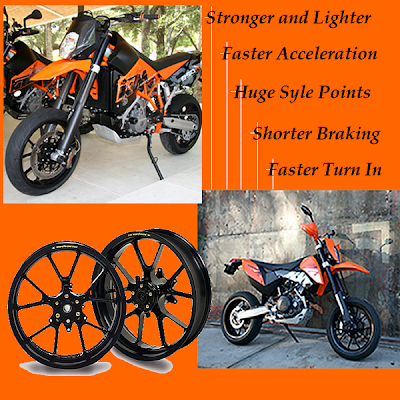 For those of you looking to throw a set of supermoto wheels on your KTM 690 Enduro here you go. Marchesini makes some of the most beautiful wheels for supermoto and road racing applications. They machine their wheels out of forged aluminum for weight savings and durability - you really have to ride a bike with their wheels to appreciate their performance enhancing ability. Lose some unsprung weight and convert your machine to a sportbike killer with a set of Marchesini Supermoto Wheels from KTMtwins.com.